I know Mike already wrote a piece on the sad passing of David Bowie, but for tonight’s Fine Art I wanted to talk about/show something as well, one of the cooler times the great man’s work intersected with both video games and comics. 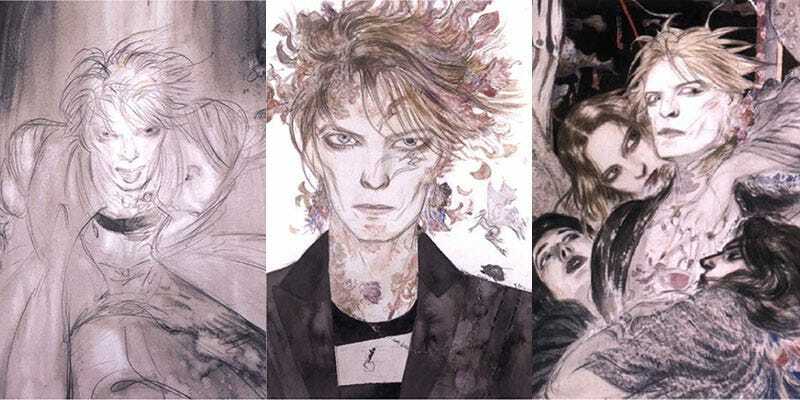 In 2004, an unlikely pairing saw comics superstar Neil Gaiman and renowned artist (and Final Fantasy legend) Yoshitaka Amano work together on a story called The Thin White Duke, a sci-fi reimaining of one of Bowie’s older stage personas (and marriage to wife Iman). It was written in two parts. I finished it for this book, but the first part was with artist Yoshitaka Amano, who was commissioned to do pictures for a magazine called V. His images were Bowie and (Bowie’s wife, the model) Iman as sci-fi characters. Then I was asked to write a story, so it became about Bowie and Iman in this future New York. You can find Amano’s art below. The Thin White Duke can be found in Gaiman’s collection of short stories called Trigger Warning.